We feel incredibly lucky to be working in such a vibrant, creative and fun industry. With almost 20 years experience in marketing, promotions and events – it’s safe to say that we are no stranger to throwing (or attending for that matter) an unforgettable party or creating a brand experience that stands out from the crowd. No matter what the event we strive to go beyond the ordinary and our Mirror Photo Booths, Rustic Donut Walls, Flower Wall, Pimp Your Prosecco Carts, Vintage Candy Carts, Giant Retro Cabochon Light-up Letters (plus a load more unique and interesting ideas) will certainly turn heads and are the perfect addition to weddings, corporate events, Christmas celebrations, baby shower, birthday parties etc. 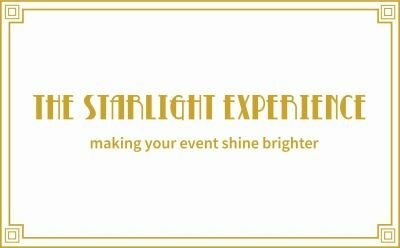 In fact, if you want your special event to shine brighter then it's time to call in The Starlight Experience. We know that every event is unique, so we’ve armed ourselves with the most beautiful, innovative, jaw dropping impressive technology, decor and guest experiences that can be customised and tailored to your brief, everything we provide will not only create the wow factor but is elegant and beautiful on the eye too. Throw in a huge dollop of our energy and passion to please, we go the extra mile to ensure everything we create for you is irresistible, enjoyable, shareable and memorable - because that is exactly how to stand out from the crowd and make your events shine brighter!